Watch your step in the Sofitel Brisbane Central lobby from September 23 to 29, or you could find yourself tasting wine in a provincial themed wine cellar and enjoying a vino therapy arm massage. So you just changed your plans to include a visit there next week? Well I don’t blame you, it all sounds rather exciting and having previewed the Spring menu, I can tell you there’s a treat in store if you decide to dine at Prive 249 as well. Inspired by French Wine Week, the Sofitel has developed this program of free events to celebrate the famous French Art de Vivre. “The new wine program is a perfect illustration of our French culture. Wine strategy is an integral part of Sofitel DNA, and we’re excited to showcase French wine and its associated rituals for our guests,” says General Manager Marcus Hanna. Sofitel sommeliers will be offering complimentary wine tasting and education classes from 5.30pm until 6.30pm Monday through Friday for guests in the lobby’s pop-up provincial themed wine cellar. The Bordeaux-inspired lobby spa zone by Stephanie’s award winning Spa Retreat will showcase vino therapy with complimentary vino hand and arm massages during the week from 4.30pm until 6.00pm from the spas expert therapists. Lavender Panna Cotta with Fresh Berries and Berry Consommé. There’s also a ticketed wine dinner in partnership with Laurent Perrier in Cuvee Lounge Bar on Wednesday September 25 with champagne specials accompanied with aperitifs of warm brie and truffle pithier. Cuvee’s popular wine flight will also be available for $20 during the weeklong program. 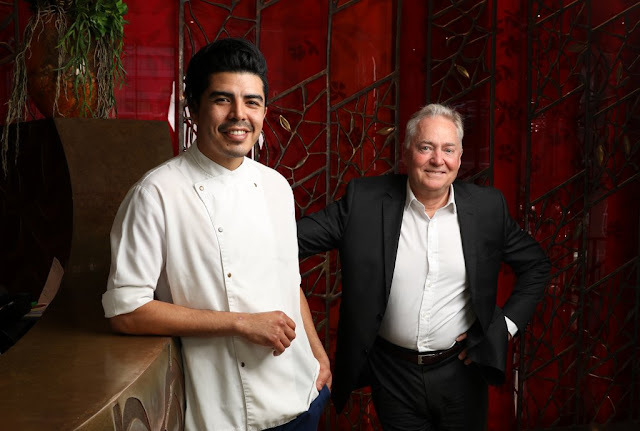 To conclude, Chef Josh O’Korn and Bordeaux expert Antoine Huray will host an intimate wine maker dinner in Prive249 on Friday September 27, with tickets from $150 for a four course menu of French and Modern Australian infused cuisine. The first of what will become an annual celebration for Sofitel, this year’s inaugural event will be held at all 120 Sofitel hotels worldwide and feature a wide range of French wines from Bordeaux, Bourgogne, Languedoc, Loire and Rhône. Disclaimer: Ed+bK was a guest of Sofitel for lunch.